There has never been a better time to write about film. In the ten years since the coming of the DVD, there have been some truly marvellous opportunities for the critic, largely caused by the presence of all that memory space on the disc, and the search for added value. The commentary track is not a recent invention. They were available on laser discs beforehand, and sometimes transferred to VHS. Somewhere in my office I still have a “collector’s” VHS of The Usual Suspects that dials down the audio and replaces it with the director and writer talking about their film. There have been occasions, hand on heart, when I have bought a film on DVD and simply watched it for the commentary. If I have already seen it at the cinema, maybe I don’t actually want to see it again. But I’ll pay £20 to hear a two-hour lecture from its writer or director. Probably not from the voice actors, though. And I’ve even done some commentaries myself, sometimes known in anime fandom as Clementaries. Unique selling points or wastes of bandwidth… you decide! Appleseed: An odd beginning, with the film company only discovering on the day that they didn’t have the facilities in-house, and having to move me and my fellow commentator to another studio. By the time we started recording, I’d been kicking my heels for six or seven hours. My fellow performer wasn’t feeling that talkative, either — for a bunch of reasons, including some personal stuff that she was keeping from everyone, but amounted to (as far as I could tell), her having to move house on the day that she was also recording a commentary track. None of these things is a welcome discovery to make when you are recording LIVE and can’t really backtrack, but we managed. I talked for England, only to have some reviewers complain that (a) I was drowning her out, or that (b) my attempts to elicit anything more than monosyllabic answers from her about a day’s work she’d done nine years earlier were some sort of convoluted attempt to chat her up. It taught me a valuable lesson about any commentary. It’s a live performance, but it is recorded, warts and all, for posterity. Anyone can have a few stumbles and fluffs, but you’re basically on your own. Since then, I have insisted on being just that. A.Li.Ce and Blue Remains. A year on, and I’m back on the commentary trail, recording A.Li.Ce and the next anime on the same day on a remote Welsh industrial estate. I took great pleasure in talking about the development of digital animation, and the fact that one was recorded right after the other makes A.Li.Ce and Blue Remains a sort of two-parter on the development of CG in anime. Detonator Orgun. Notable for my invention of the Detonator Orgun drinking game. At least, that’s all I can remember about this one. Vampire Hunter D. Partway through this DVD, while I talk about various culture’s vampire traditions, you can hear me having an idea for a script that would eventually become Snake Head. Spriggan. My favourite, if not only that for the first time I was hired to talk about a film that I had genuinely followed from its very inception, having been formerly hired to translate the pre-production script by a company that was considering investing in it. So I actually had some genuine behind-the-scenes information about the production that nobody else could have supplied. And I also took the opportunity to ask why the people who build secret underground hideouts are always on time and on budget, unlike the people fixing my bathroom. Spirited Away. The commentary that never happened. I spent a week writing 25,000 words of notes, ready for the ultimate, super-duper commentary on the production and mythical background of an Oscar winning movie. This was to make a rashly-advertised Special Edition actually Special. Except the distributor didn’t have the right to actually add content to one of Studio Ghibli’s DVDs, and were slow to realise this. Eventually, they cancelled the recording the day before it was scheduled, and sheepishly paid me off. Robot Hunter Casshan. In an elaborate sting operation, an agent from ADV Films attempted to poison me an hour before I went in to record this for Manga Entertainment. An innocent lunch beforehand with Hugh David had a series of unpleasant after-effects in the studio, and left me drooling and… well, probably too much information. But we recorded it anyway, with a brief pause for 20 minutes about halfway through while I writhed in agony. 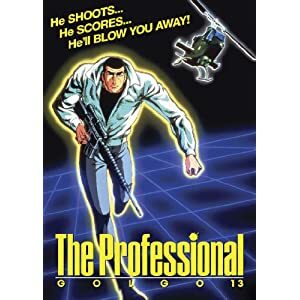 Golgo 13. I sat down in the booth and started wittering confidently about missing footage from this movie, only to discover it had all been put back in. While the producer pointed at me through the window and laughed, I had to spin on a dime and re-tool my thoughts. We could have gone back to re-record, but Manga Entertainment quite liked the sound of me discovering, live, that long-lost material had been restored, and rather enjoyed the sudden enthusiasm I apparently developed. Actually, I think they just liked hearing me sputter with surprise. Vexille. An interesting dilemma, with an intensely political film but a director who insisted (largely, I suspect, out of misconstrued Japanese modesty) that it’s just mindless entertainment. “Jonathan Clements is having none of that!” commented one reviewer, as I proceeded to draw a whole bunch of political parallels, as well as commenting on further developments in digital animation. A nice commentary, and eventually situated on the disc with a bunch of other material in which the director and I inadvertently end up wholly agreeing with each other. We’d both been misrepresented, it turned out.